You are pretty much in for the treat of your lives today. Why? Because it’s mac & cheese mania day. My friends Rachel & Brandy are hosting a mega mac & cheese party and YOU are invited. And how doesn’t love 50+ new mac & cheese recipes? You can – for sure – count me in. I have a deep-flowing adoration for any kind of macaroni and cheese. From the classic blue box to as unconventional as you can get – like turning your favorite appetizer into mac & cheese. Call me crazy but we have been gone from KC for over a year and I still miss Jose Pepper’s espinaca dip. My version is pretty close to the real thing and I find my self craving it over and over again. I don’t make it too often because, let’s face it, it’s not great for you. But it’s soooooo good. And it’s cheesy. It has a few veggies in it. Super simple. I think that is the perfect combination for mac & cheese, yes? Yes, without a doubt, my new favorite macaroni and cheese. It’s so creamy and full of different flavors. Not too spicy, but with just enough kick to keep you going back for more! 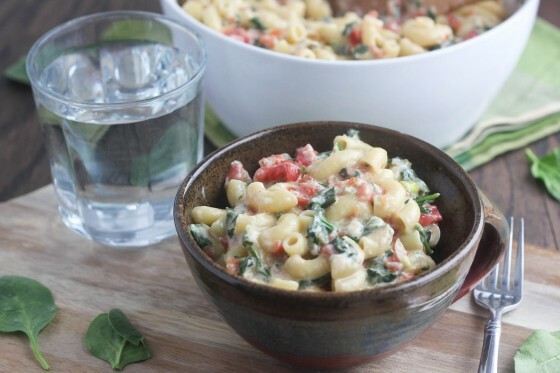 Creamy and flavorful mac & cheese with a restaurant-style spinach queso twist. Heat the olive oil in a medium skillet and add the jalapenos and green onions. Cook for about 3 minutes, or until fragrant. Add the Ro-tel, diced tomatoes & cilantro and stir until all of the ingredients are distributed. In a large non-stick skillet, melt the butter. Add the flour and whisk vigorously as the mixture turns into a paste. Stir almost constantly while creating the roux until the mixture is slightly golden brown. While whisking, stream in the milk and stir often until the milk begins to thicken. Add both cheeses and stir until melted. Stir in the spinach and jalapeno/tomato mixture. Season with salt and pepper to taste. Pour the cheese mixture over the cooked pasta and serve. 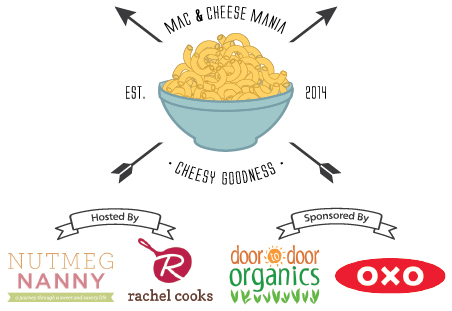 Mac & Cheese Mania is being sponsored by Door to Door Organics and OXO. All you have to do to be part of the fun is to visit Nutmeg Nanny and/or Rachel Cooks and share your favorite macaroni and cheese recipe. Prizes up for grabs include Door to Door Organics Gift Cards, OXO Gift Baskets, Zak Designs Prize Pack, a year’s supply of Cabot cheese, Barilla pasta, Anolon Advanced Bronze 4.5 Qt. Tapered Stockpot, and MORE. All giveaways open to US residents over the age of 18 only. Note: You do not have to have a blog to enter. Rachel’s and Brandy’s sites will explain all of the details. This recipe looks amazing! All that flavor…sign me up! I’m loving the addition of jalapeño. I’m always a fan of adding a little heat to my meal 🙂 Thank you for joining in on the fun! What a great recipe for the mac and cheese mania party! This is soooooooo up my alley! Bring on the cheese! This is genus! I can just spoon/shovel the spinach queso directly into my mouth! Holy mother of God this is brilliant. This is pretty much the best day of my life. Mac and cheese all over the place, and I LOVE your version! Spinach Dip and Queso are two of my favorite things. 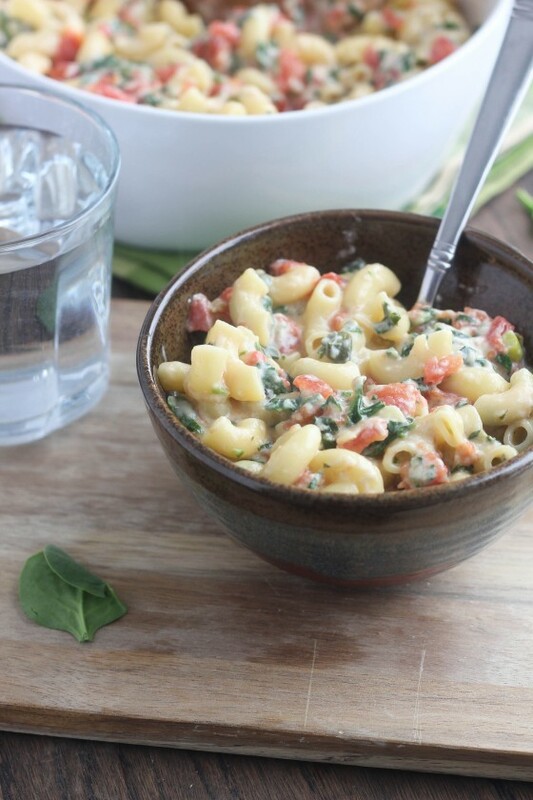 Well I do so love my mac and cheese with a hint of spice, and I also love all these veggies that are mixed in! I will definitely be trying this ASAP. Why can’t it be mac and cheese week EVERY week?! I LOVE finding new mac & cheese recipes, Cassie! This version looks out of this world. Love sneaking in some greens. This looks just gorgeous! I love how the veg lighten it up a bit 🙂 delish! Everything about this just sounds amazing!! I’m definitely saving this recipe and plan to try it out soon! Thanks for sharing!! officially been inundated with mac n cheese recipes in my feedly but i think this one takes the cake (err cheese? )…must try this! I’m so beyond over excited for this mac and cheese mania – you people all just get me!! This looks fantastic, Cassie! 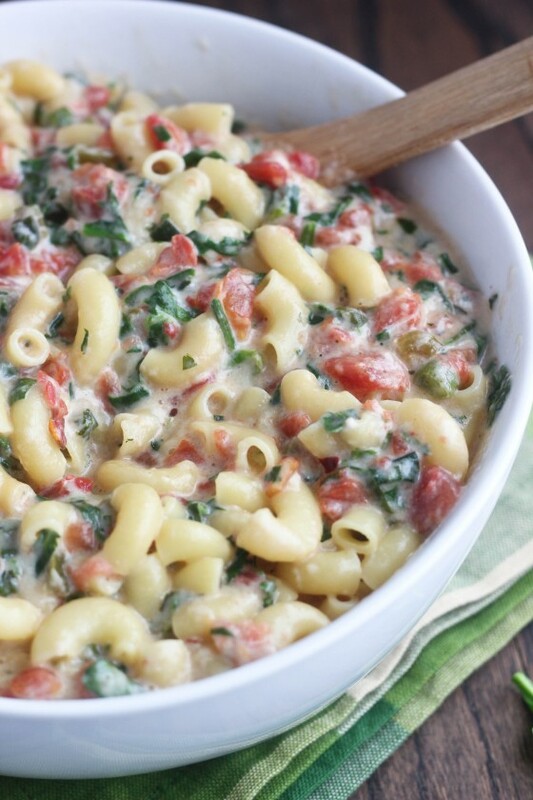 Love the dip and mac in one! Ohhhh myyyyy gossshhhh! Cassie I think you’re pretty much a genius for this! Cassie this is gorgeous. Your photos are spectacular. I just want to take a huge bite of this one. Yum! Love the spinach and the tomatoes in there. A whole new level of mac n’ cheese! Mac & cheese has never looked so good, Cassie! If only I could dive right into that bowl! Can’t wait to try it!! When do you add the cilantro?? Looks delicious! Sorry about that! Same time you add the Ro-Tel…it’s in there now! Thanks! That’s when we added it in so just wanted to double-check. Made this tonight & it was super yummy!